The Long-Awaited Healthy Cookie Recipe Cookbook is Here! Laura’s Wholesome Junk Food is proud to introduce The Wholesome Junk Food Cookbook including more than 100 healthy recipes for everyday snacking. These healthy cookie recipes are great for: picnics, outings, traveling, camping, graduations, celebrations, summer time fun! To buy the main ingredient for these recipes – your favorite type of healthy cookies – simply order online or search for a store close to you. 2. Add a pinch of sea salt to the warm syrup. 5. Your fudge sauce is done and will last in the fridge for at least a month. It WILL thicken in the fridge but don’t worry. To make it more liquidly, just place some fudge back on the stove and warm slowly – it will become liquid again (the viscosity/thickness is decreased). 6. To watch this being made, go to YouTube and watch in high quality. You can also use this sauce as a topping for the healthy cookies recipes below. 2. Prep a pie pan, or like I do, put cupcake paper liners in a cup cake tin – I like many mini pies! 3. Throw everything into the blender all at once including the ¼ cup of maple syrup or agave. 4. Taste it after it is blended. 5. Add the rest of the sweetener if you want it sweeter. 6. Bake until you can touch them lightly with a spoon and no batter is on your spoon. If you do a big pie versus little mini-pies, it will take longer to bake. Just check every 5-10 minutes with cup cakes or after 20 minutes with a large pie. Use Grandma’s Gingerbread or Lemon-Vanilla bite-lettes ® in this healthy cookie recipe. Core, peel & slice an apple. Place in an oven-safe container and break up two gingerbread bite-lettes ® over the top of the apple. Heat in the oven at 300 degrees until it is until soft and a bit caramelized. *Dr. Laura likes lemon-vanilla bite-lettes ® in this healthy cookie recipe. Use your favorite bite-lettes ® in this healthy cookies recipe. Take one 7oz. container of any Bite-lette ® flavor and press into a pie pan for a quick, healthier pie crust. For a chocolate crust use Xtreme Fudge or Better Brownie. For a chocolate mint taste use Mint Double Fudge. For a more traditional crust you can use Oatmeal Raisin and Lemon-Vanilla. The next two healthy cookie recipes use Grandma’s Gingerbread bite-lettes ®. This healthy cookie recipe is great when you’re craving something creamy. Take one gingerbread bite-lette ® and set it on a clean, smooth surface. Using the rolling pin, roll out the “dough,” keeping the circular shape, until it is about 1/8 in. thick. Set aside. Do the same to another bite-lette ®. Smear cream cheese on one of the flattened bite-lettes ®, then top with the other flattened bite-lette ®. This healthy cookie recipe is one you will use year after year. Take about 6 gingerbread bite-lettes ® and press them together on a clean, smooth surface (I used a cutting board). Using the rolling pin, roll out the “dough” until it is about 1/8 inch thick. You want it thick enough to hold together yet not so thick as to pose a problem cutting. Taking the cookie cutters, carefully cut out your favorite shapes & decorate with sprinkles, etc. Remaining dough can be mashed back together and rerolled with more bite-lettes ® to make more cookies. For more healthy cookies recipes, look for Dr. Laura’s The Wholesome Junk Food Cookbook. Her new cookbook contains healthy cookie recipes, pie, cake, and snack recipes, and more for everyday snacking. 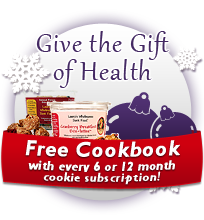 Do you have a healthy cookie recipe using some of Laura’s healthy cookies? Share it with us at info@lauraswholesomejunkfood.com.